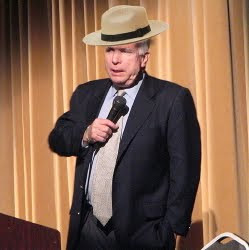 McCain a Panamanian Sleeper Agent? Some charts from the New York Times presenting data from the Democratic primary battle. I'm not sure what conclusions, if any, can be drawn from the first chart, which shows that out of the states which Bush won in 2004 that have held their primary contests already, Obama's gained 96 delegates net over Clinton, while in Kerry states, Clinton netted 15 — too many other variables correlate with "red" vs. "blue" statehood. The other two are informative, though; they show that superdelegates not deciding this race is about as likely as Huckabee's "miracle", and that this race would be just as close if the primaries were winner-takes-all, either by state or by congressional district. "What do you expect me to do, Race Car, mortgage Baltic Avenue?" "No, Mr. Thimble, I expect you to die." "Pop quiz hot-shot: You've just rolled your second doubles. If you roll doubles again, the bus explodes. If you don't roll doubles, I kill every man, woman, and child in Marvin Gardens. What do you do? What do you do?!" "Ye can take our hotels, but ye'll never take our FREEDOM!!" With its highly evolved social structure of tens of thousands of worker bees commanded by Queen Elizabeth, the honey bee genome could also improve the search for genes linked to social behavior.